It’s time. You’ve decided to start studying for the GMAT, but now you realize that there is a ton of information out there and you’re not sure how to get started. Should you take a GMAT course or should you study on your own? What books should you get? How long does it take to study for the GMAT? This article will answer all of these questions. So to start off, you should take a practice test. A lot of people don’t like to do this because they’re scared of what they might find out, but you should take the plunge and just do it. A good free practice test can be found on Manhattan GMAT's website. It's a good idea to not use Kaplan's practice test because the variance of student's scores compared to the actual GMAT exam is too high and their analysis after the test isn't as good as Manhattan's. Once you know your initial score it’ll be easier to figure out exactly how much work needs to be done. Generally, it takes about 200 hours of studying to improve about 100 points on the GMAT if you study in the right way. So if you start out with a 550 on your practice test (under test like conditions) and you need to get about a 680 then it’ll probably take you somewhere between 200 and 250 hours of studying. This, of course, varies between students. If you’ve been out of school for a while it may take more time to get back into the rhythm of things than if you’re fresh out of college. But on average, it’s around 200 hours for 100 points. Next, you need to know what and how to study. 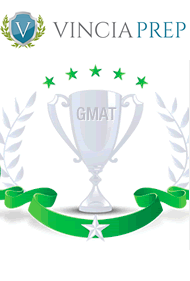 Currently, some of the best books on the market come from Manhattan GMAT. If you’re going to just study on your own these books are a good place to start. Don’t start with the official guides by GMAC. The official GMAT guides have great questions but the explanations and strategies aren’t so good. Thus, you’re better off starting with the general strategies from a test prep company’s book and then moving on to the official guide than vice versa. Also, keep in mind that you're being compared to other students and most other students use Mahattan GMAT as well. Thus, it's also nice to use some other materials that not everyone uses so you can see some tricks that others might not learn. Most of my students have found the questions from GMAT Hacks to be useful (of course you do your GMAT preparation with Vincia Prep we'll give you access to a lot of supplement material as well as the Mahattan books). But should you just work on your own? This depends a lot on your personality. If you learn well from reading, you're motivated enough to study on your own, and you have plenty of time to study then there’s a decent chance that you can study for the GMAT without paying for a class. On the other hand, if you need someone to push you, then you’re probably better off taking a class. Also, if you would prefer more individualized attention and you are generally at the top in your class, or below average then private GMAT tutoring will most likely serve your needs best since classes usually go at an average pace. Furthermore, even if you are motivated, some GMAT classes could still help guide your studies and put you on the right path, allowing you to do the rest on your own after you've done the courses. Indeed, GMAT classes work best if you have time to study and put into practice after the courses all the strategies that you learned during your courses. If you decide to not take a class the one bit of advice that I think is of upmost importance is to make sure that you keep track of all of your mistakes. Don’t throw away all of your work because then it’s much tougher to learn from your previous work. Do the questions in an orderly manner and keep them for later review. Lots of people think that reviewing the questions right after you do them is sufficient, but it’s not. You need to review all of the questions that you had trouble with at least a second time about two weeks later to make sure that you’ve really learned from your mistakes. If you follow the above advice you’ll be well on your way to beating the GMAT and if you want some more tips you can watch the video below! Do MBA programs prefer the GMAT or the GRE? For how long is the GMAT valid in top schools? Is there a penalty for retaking the GMAT? If you need help, please contact Dan now. In order to provide a maximum amount of attention to all of our students we can only accept 10 students per month.